Provensen was 10 years old in the election year 1928, and in her introduction to this remarkable new work she recalls skating through the streets of Chicago shouting with delight, ``Hoobie Heever for President!'' and echoing Calvin Coolidge's famous ``I do not choose to run!'' 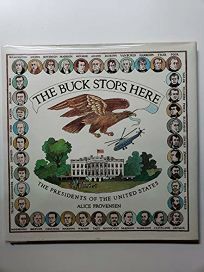 Now, with The Buck Stops Here , Provensen provides children with 41 delicious slices of history and a jumping-off point for their own political awakenings--and she does it in glorious style. Square, oversized pages feature portraits of each president, rendered in the artist's familiar, folksy paintings. The portraits are surrounded by lively depictions of the issues, achievements (and, in some cases, missteps and misconducts) that marked each chief executive's years in office, stirring bits of presidential speeches, as well as significant nonpolitical events from those years. Rhyming couplets incorporate each name and number with easy-to-remember phrases about each presidency: ``Teddy Roosevelt, Twenty-six / Whisper softly, wave big sticks.'' All of these details manage to convey the larger-than-life qualities that helped carry these men to the White House and, at the same time, remind us that presidents are only human. This shining example of children's nonfiction clearly illustrates why this important category is gaining a foothold in bookstores. Like all the best nonfiction, Provensen's work should tempt readers to further research. Yet the book is also a treasure in itself; no matter how often one mines its informational gems, its riches are not depleted. The Buck Stops Here has all the feel of an immediate classic. All ages. (Sept.).